If you follow me on Instagram or Ravelry, you can't miss my love for hand knit socks. I pretty much always have a pair on my needles and usually a pair on my feet, too! More than half of the socks I've knit have been gifts for people I love. Handmade socks as gifts can't be beat because the time and love that goes into a pair really make them special. Knitting them for yourself is pretty special too. 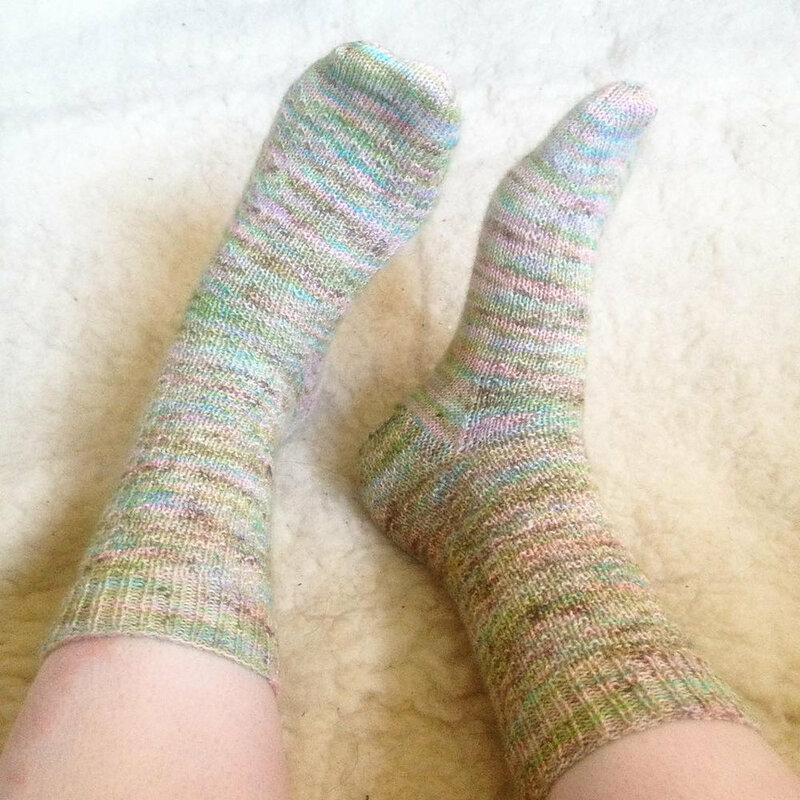 Every pair reminds me of the time and place where I knit them, and there's a certain joy that comes from making your own clothes so that even when it's something like socks that most people won't see, you just feel good and extra cozy wearing them! The socks above I started when I was pregnant with James, and I finished them two days ago after knitting in tiny fits and starts usually with the baby asleep on my chest. I definitely would not recommend following a complicated lace chart when you've only had four hours of sleep, haha, lots of "un-knitting" ensued when I missed instructions. But still, so worth it! I had been saving that yarn in a colour I LOVE (called 'Beachgrass') and I couldn't be happier with how it turned out. I think these socks will always remind me of newborn James. 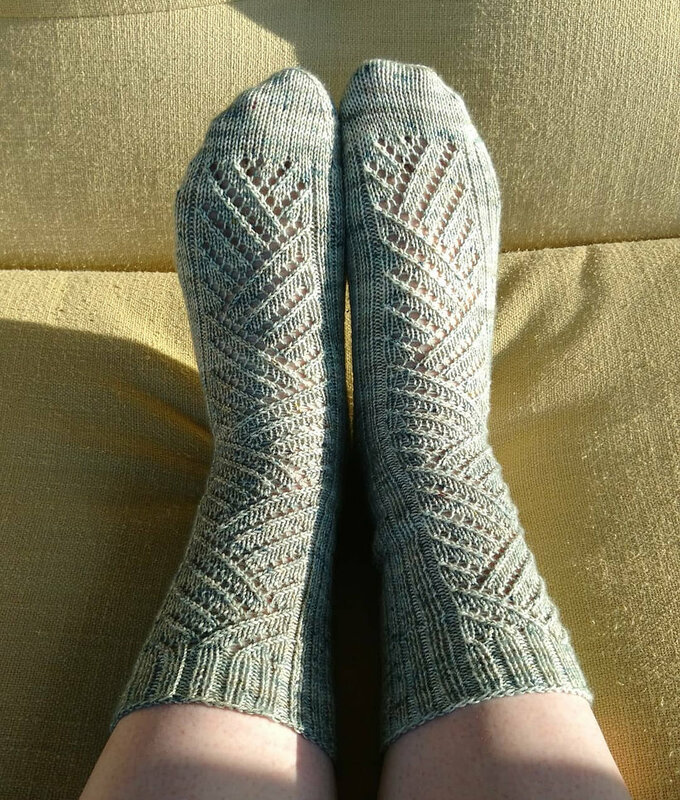 These socks were so fun to knit - and since I love Harry Potter (and especially Hermione) I secretly loved that the pattern was called 'Hermione's Everyday Socks'. These were also my first experience with speckly yarn and I loved knitting them and seeing the colours change all the time. When I wear them, I remember Molly in her 1-year-old cuteness and how I would be knitting and then hiding my knitting bag as high up as possible so she didn't grab at it and rip everything off the needles. Ha! These Broken Seed Stitch Socks were a project that helped me through this pregnancy with James. My therapist suggested knitting to reduce stress and I would even bring my knitting bag to the hospital for appointments to help distract me. I think the broken seed stitch pattern is beautiful, although it definitely slowed my knitting speed to keep changing colours! So there we go. My favourite socks that make me feel happy every time I wear them!